Keep your drink cool and your hand dry! The warm weather is usually synonymous with cold drinks. I know when I’m out and about I like to order a grande skinny iced vanilla latte from Starbucks. It totally hits the spot and gives me that much needed jolt of caffeine. 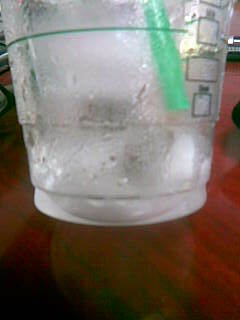 However the thing I alwas struggle with is how my plastic cup sweats! This is a huge annoyance to me. So much so that I’m usually seen swathing my cup in about 78 napkins just to keep the moisture at bay.There is nothing worse than trying to enjoy your favorite bevvy and having liquid drip down your wrist. If you’re like me and can’t stand sweaty drinks fear not. I think I found a solution. As I was waiting in line to give my order to the barista I glanced over at the accessories table. 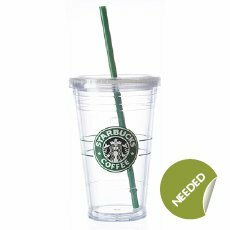 There stood a venti plastic cold drink cup with a green plastic straw. “What’s this?” I mumbled to myself. I didn’t even hesitate when I saw the $14.95 price tag. All I thought about was the aluminum SIGG bottle I’m using now to drink my water and how it creates rivers of water on my desk whenever I fill it up. I instantly snatched up one of these venti insulated cups. They look like they’re selling out fast so I recommend you go out and get one too!